Having had porridge and coffee I left the camp site at a reasonable hour, with the tent once again wet and muddy. No sun this morning – but that’s good cycling weather anyhow. I made good progress in the morning and stopped off for an early lunch just after 12. 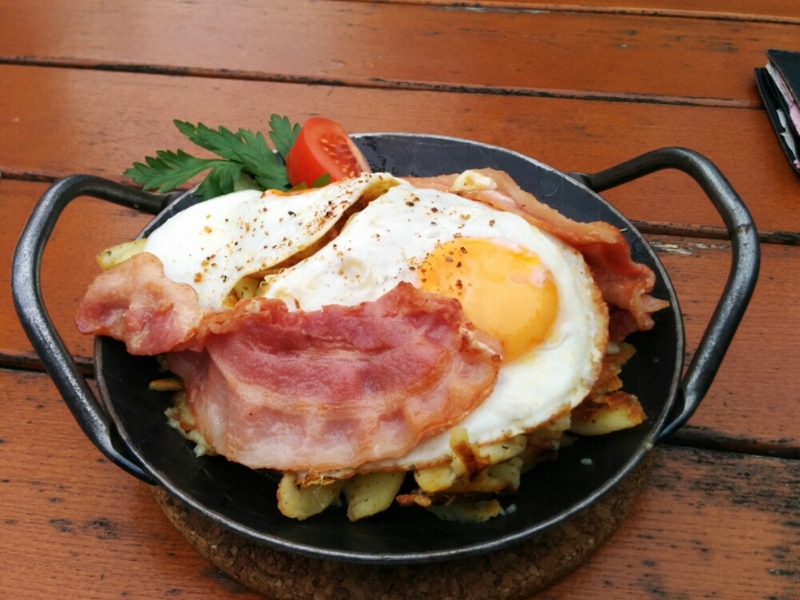 Generally things on menus are quite descriptive and most of the time I don’t know what it is exactly that I’m ordering – but that’s OK because I like the surprise.. What I received was in effect a very nice fried breakfast. After lunch the weather deteriorated into a drizzle. In good news although there were a lot of hills today, the majority were downhills with a few nice hairpin treats. For the past few days the housing has been chalet style, often ornamented with large displays of flowers. 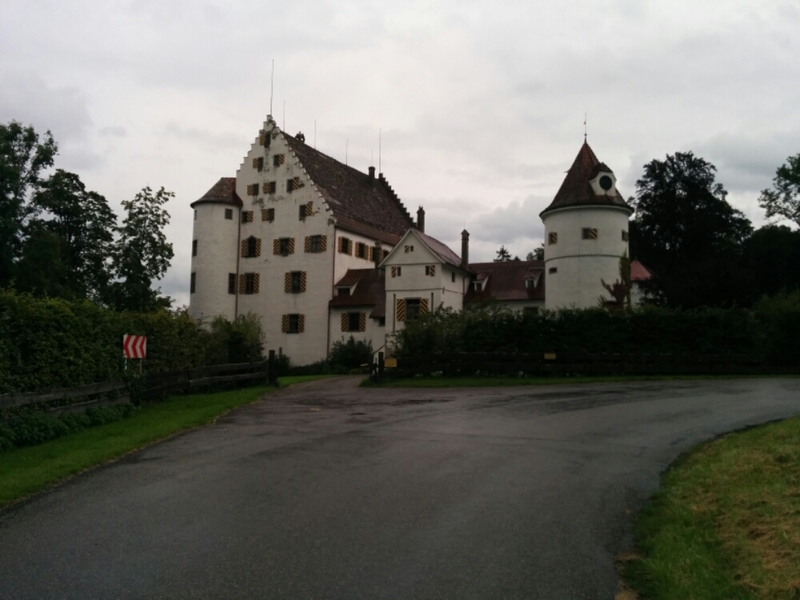 Today I cycled out of the ski resorts towards Bodensee, and the houses are looking less ‘alpine’. Virtually all houses have brightly coloured window shutters (always open). This one had black and yellow chevron shutters which looked odd. In fact this house is very strange all over.. Shortly after that picture was taken, it started to bucket down. I took partial shelter under two chestnut trees for half an hour (one tree for me, another for the bike). It lightened a bit but didn’t look like it was going to stop any time soon, so I got on the bike and cycled on. It got very bad again very quickly and after unsuccessfully trying to get some shelter in a pine forest I found a bus stop at which to shelter. With the next bus due on Monday I made myself comfortable and brewed a coffee. 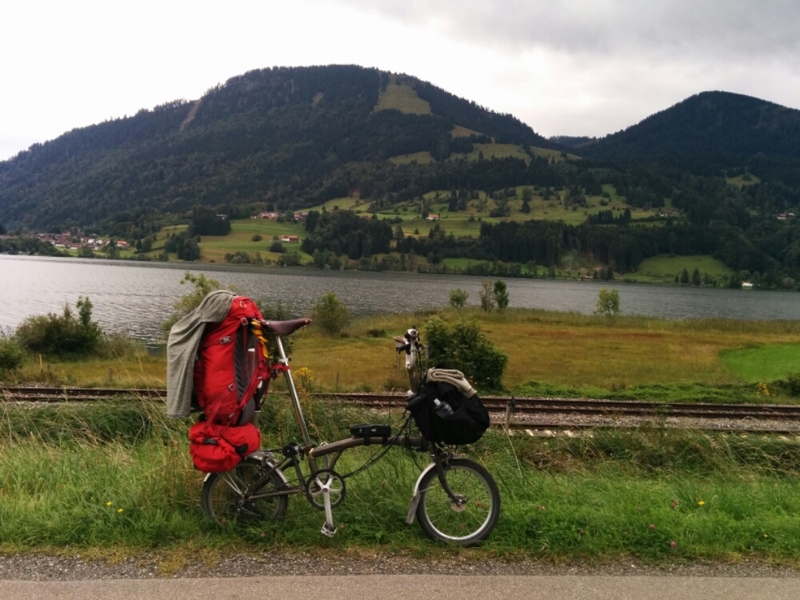 The weather didn’t get much better, but I did have a bit of phone signal at the bus stop and found a hotel on the island if Lindau about an hour’s cycle away, booked myself in and set off. A pretty miserable cycle, but my gore jacket kept my top half completely dry and stopped the wind, so I wasn’t feeling too bad. Could have done with some gloves though. I squelched into the hotel and made good use of the hot air heater in the bathroom to dry everything out. I went to a Thai restaurant for dinner and ordered the ‘very hot’ fish curry to head off any potential cold, and am now in the harbour-side bar as recommended by the restaurant staff to write this blog. 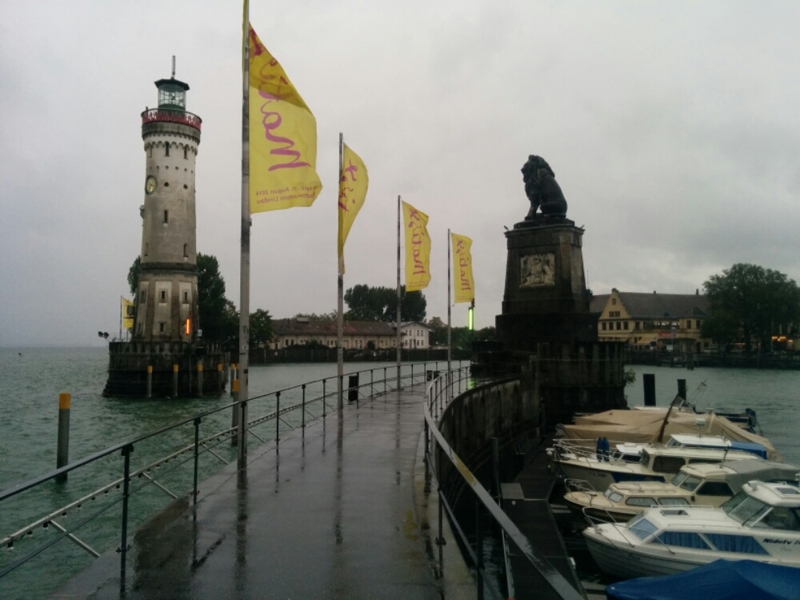 Here’s a pic I took earlier of the Lindau harbour entrance. Note the wind and rain.. Fingers crossed for a brighter tomorrow. Großer Alpsee to Lindau island, 68 km. Total so far 1,915 km. Previous: Previous post: Day 22 : Has anyone seen my glove? It took me 23 days to find this blog .. anyway I am here now. I have a lot to catch up and you to cycle. See you tomorrow. I like the food pics, keep them coming! I hope the weather gets better for you , don’t let it get you down. If you make it down to Poitou-Charentes region of France then pop in. Thanks for sharing your trip and have a wonderful ride. Thanks Mark + the weather has cheered up a lot today. Chain has been oiled and all good.